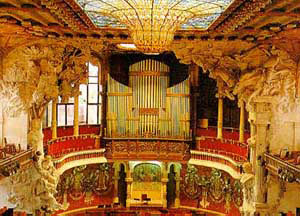 The Palau de la Musica Catalana is a wonderful music hall built in modernist style by the Catalan architect Llu?s Dom?nech i Montaner between 1905 and 1908. Address: Sant Francesc de Paula 2, Barcelona, Spain. This modernist hospital, designated UNESCO monument in 1997 was designed by Domenech i Montaner. Being a public hospital you can visit it for free, though there are guided tours too. It is a whole block of buildings, with some green areas in between. Metro: Hospital Sant Pau, Cartagena street exit. 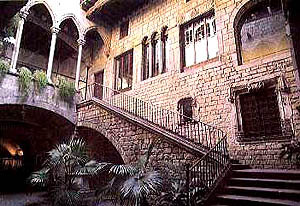 The Picasso Museum is across Via Laietana, down Carrer de la Princesa, and right on Carrer Montcada - a street known for Barcelona's most elegant medieval palaces. Picasso spent several of his formative years (1901-06) in Barcelona, and this collection, while not one of the world's best, is particularly strong on his early work. Displays include childhood sketches, pictures from the beautiful Rose and Blue periods, and the famous 1950s Cubist variations on Velázquez's Las Meninas (Ladies-in-Waiting).COST: EUR4.50; free 1st Sun. of month. Tues.-Sat. 10-8, Sun. 10-3. Address: Carrer Montcada 15-19, Barcelona, Spain. The Pedralbes area, North part of the Diagonal avenue, is one of the chic neighbouhoods in the city. There are beautiful shopping malls and a young atmosphere because there is a University campus there. You can also visit here the royal palace and its ceramic museum (the park in front is very beautiful) or admire some examples of contemporary architecture. I have always liked the building on the picture. Seems nice to live in an apparment where so many plants hang from the balcony.